This will apply to most students being admitted for a 2017 term and onward. You will be provided an Office 365 Outlook email account and provisioned with an email in the format of username@chapman.edu . To access this account, use the Outlook link below and log in with the student email and password that you will have received in a letter from Chapman's Office of Admission. See User Guide for first-time setup. If you have activated or reset your password recently, please allow the system to update for up to 30 minutes prior to logging in. This will apply to most current students, and alumni, already at Chapman in 2016 or prior. 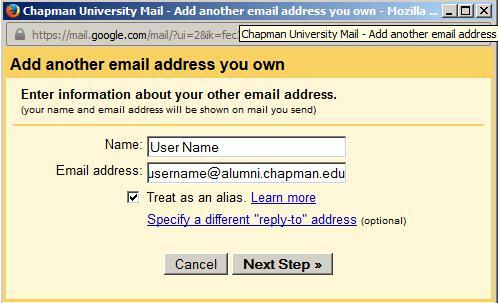 If your email ends in @mail.chapman.edu you will continue to use your PantherMail account, powered by Google. Login at the link below. All students should review the Email Usage Guidelines for tips on using email appropriately at Chapman University. And it's not just email. With your PantherMail account you get a number of other tools. With Google Calendar you can schedule your social and academic life, create personal calendars, invite friends to events, and set up meeting times with your classmates. 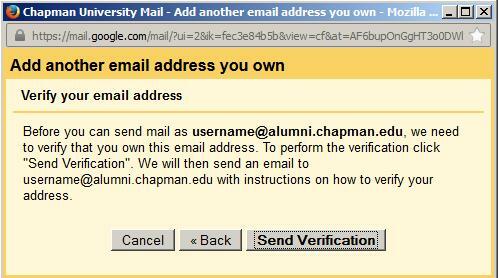 Your email address will be of the form username@mail.chapman.edu, where username is your Chapman account name. Why is the University using Google email? With Google Apps students will now have larger storage space and a suite of tools such as email, calendars, document sharing, start page, and instant Messaging all from their @mail.chapman.edu account that will enhance their email experience. Gmail is Google's search-based webmail service that combines the best features of traditional email with Google’s search technology. If you already have a Gmail account, it is okay. You will have another account for just your Chapman email. Email addresses will be of the form username@mail.chapman.edu, where username is your Chapman account name. Who is eligible to get a PantherMail account? All newly admitted and existing students will have a PantherMail account created on August 15, 2008, but prior to admits for Fall 2017 term. Alumni students will continue to have a WebMail account but, in the near future will be migrated to a PantherMail account. Adjunct faculty and staff will continue to have a WebMail account but, in the future will be migrated to a new email system. Full-time staff and also a student will still have an exchange account and a WebMail account. In the future, the WebMail account will be migrated to a new email system. Full-time faculty and staff will still have an exchange account. Will I be able to keep my email address after I graduate from Chapman? Yes, your Chapman Gmail account will continue to work after you graduate. How much storage space will I have with PantherMail? Each student will receive 6.5GB. What is the maximum size for a PantherMail attachment? PantherMail limits the attachment size to 20MB but, the recipient’s email system may not allow attachments of this size. Here are links to Google's website for help with the applications. Google has one of the best spam blockers in the business, and it’s integrated into Google Apps. How do I get into the new PantherMail service? To log into your PantherMail account. You will be prompted for a username and password at both sites. I can't log into my PantherMail account. How do I get my password reset? Contact the Computer Service Desk at 714-997-6600 or servicedesk@chapman.edu for assistance logging into Gmail. How do I forward my email from PantherMail to another email address? We would like to encourage you to try the PantherMail service, which includes Google Chat, Documents and Calendar, but if you wish, you can forward incoming mail to another email address. Click 'Settings' link at top of PantherMail. Click 'Forwarding and POP/IMAP' link. Select the action you’d like your messages to take from the drop-down menu. We recommend you choose to keep a copy of messages sent to you in your Chapman University Gmail inbox, or you can choose to send it automatically to All Mail or Trash. Can I use other email clients? See Google's website for POP configuration instructions. 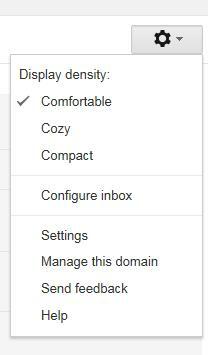 See Google's website for IMAP configuration instructions. How does this new address affect communication using the Chapman Blackboard? Will Google read my email? Google does NOT read your email. Does Chapman or Google share my personal information with any outside organizations? 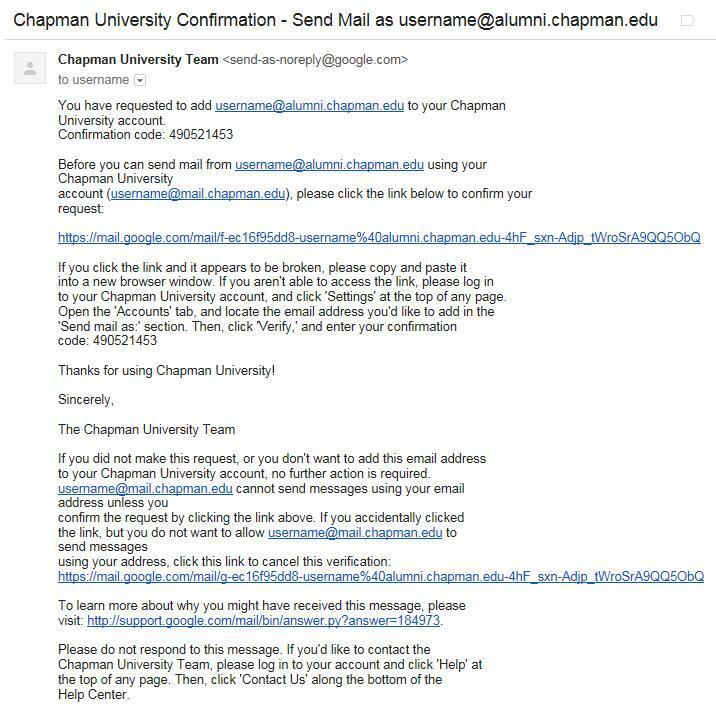 Is my Chapman PantherMail account secure and private? This service is being provided by the University as the primary email/collaboration system for students. University policies will apply to the service. Your Chapman PantherMail account has been customized for optimal educational collaboration. Chapman University has taken steps to ensure that your student data is protected above and beyond a publicly available account. IMPORTANT: Be sure to always LOG OFF on the computer or click the SIGN OUT button when you are finished using the computer or your PantherMail account on a shared or public computer. 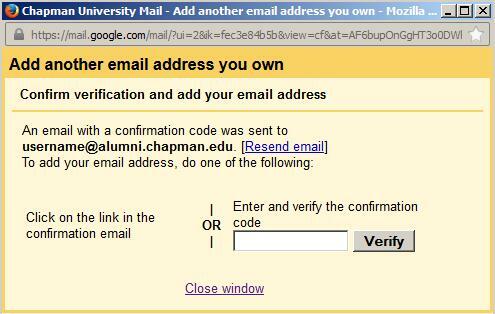 To use @alumni.chapman.edu to your Panthermail account please follow the steps below. Open up PantherMail, click on "Settings"
From the settings page click on "Accounts" at the top. On the right side of "Send mail as": click on "Add another email address you own". When the box pops up, enter your name in the Name field and enter your email address username@alumni.chapman.edu, click "Next Step". This will send a verification code to your Panthermail email account, verifying you own the mailbox you want to add. Click on "Send Verification"
You will receive this email verification code in your email. Check your email, copy the "confirmation code" number, and paste it into the "Verification field". If you want to make @alumni.chapman.edu your default email address, go to "Settings", click on "Accounts", and on the right side click on “Make Default” next to the username@alumni.chapman.edu. To select the new email account as the from account, click the "down arrow" next the email address in the from field. Your second account you just added will now show up as an option on the send from field.